BANGI, 20 Oct 2012 – Only one of the two reciepients of the Royal Education Award was present to receive her gold medal and cash of RM5,000 from UKM Chancellor Tuanku Muhriz Ibni Almarhum Tuanku Munawir at the first session of the university’s 40th graduation ceremony today. Athirah binti Mohd Anuar graduated with an excellent citation for her LLB Hons and hopes to pursue for her Masters in either International Law or Syariah Law, specifically Islamic Banking. She already has a diploma in Syariah Legal Practise. The other reciepient Arththi Sathananthar graduating with a BA Hons (Literature in English) was not present to receive her award as she is already in Britain pursuing for her masters. Athirah told UKM News Portal that she enjoyed her four years of studies at UKM being involved in many student activities including travelling to other countries describing them as both rewarding and eventful. She entered the Moot and Client Counselling competitions as well as participating in the students Mobility Outbound programmes where she visited China and the Overseas Study Programme staying in South Korea. “My four years here were not spent just studying,” she said advising the new first year law students to enjoy their time as students and not be too stressed. “Yes, law is a heavy subject but it’s not just about studying, you really have to have a good time and really love what you’re doing. I really believe that you should have fun when you’re studying,” Athirah said. She said that though she now enjoys law, her initial choice was medicine but her father advised her to consider other options after her SPM results scoring 8A’s. She took Law Foundation in Universiti Teknologi MARA (UiTM) for one year before choosing to study law in UKM. “I got an opportunity to visit a few of the Law Schools to decide where I’d go from Foundations, among them was UKM. 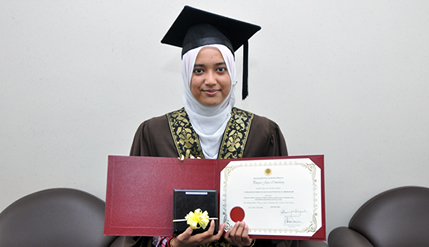 I chose UKM because I like the environment and scenery of the campus,” Athirah said. The only daughter of five siblings, she was glad that she was able to get through a very emotional time during her second year with the help of her friends and classmates when she lost her eldest brother to cancer.